Seed Savers Exchange Orchard Manager Dan Bussey is known around Heritage Farm for a lot of things. Most obviously he’s known for a vast knowledge of heritage and heirloom apple diversity and his upcoming book documenting thousands of them. In fact, he’s known nationally for his knowledge on everything apples. Still, many staff members know him for his colorful comments on all-staff e-mail threads; a few lucky folks know him for his skills as a hard cider and apple brandy maker; if you’re in the right place at the right time, you know him for his fantastic apple pies. I recently caught up with Dan one morning and tagged along as he performed his magic, whipping up one of these famous pies. When you have an orchard like Seed Savers with 550 apple varieties, no two pies are the same (or at least they shouldn’t be—what’s the fun in that?). Knowing which varieties were ripe and ready this week, Dan led us through the orchard to collect apples from the Lewis Incomparable, Worchester Pearmain, and Summer Gold trees. I asked Dan what the pros and cons were for using multiple varieties in one pie. The obvious answer was because of the complexity an assortment of apples will add to the flavor, but also that different textures can be complementary. Having one apple variety that cooks down and loses its form will give the pie an apple filling to supplement the other, firmer apple slices. Just remember to slice harder apples thinner and slice softer apples thicker. Dan also mentioned how Northerners have traditionally used tart apples for their pies, while Southerners prefer sweeter apples, so the level of sweetness for pie apples is a matter of preference. Peel and slice apples, putting them in lemon water to prevent oxidization and to provide a little tartness. Slice thin for firmer apples that hold their shape when cooked, such as Lewis Incomparable, and slice thick for varieties that cook down, such as Worchester Pearmain or Summer Gold. Preheat oven to 375. Prepare crust and place bottom crust in pie pan, letting it hang over the edge. Remove apple slices from lemon water and toss in a bowl with sugar, cinnamon, tapioca, ginger, cloves, allspice, and nutmeg. Arrange apples slices so there are no gaps or empty spaces. Brush on milk or cream on bottom crust as glue, and place top crust over apples. Using a fork, apply pressure around the edge to seal. Fold bottom crust over top crust, and make your way around the edge, pinching to seal. Cut slits in the top crust to allow steam to vent out. 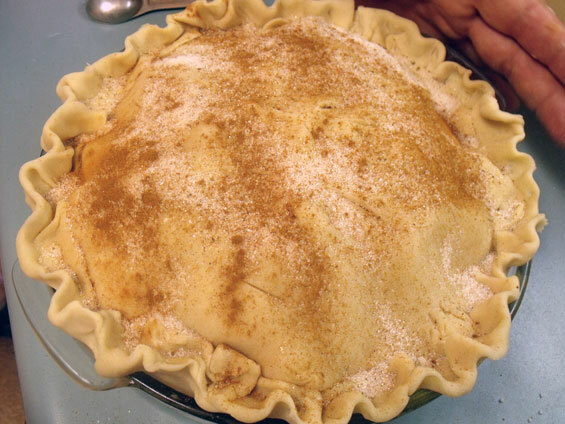 Sprinkle pie with cinnamon, sugar, and Vietnamese cinnamon, to taste. Place in preheated oven for about 1 hour, or until bubbles and steam come out of the vents. 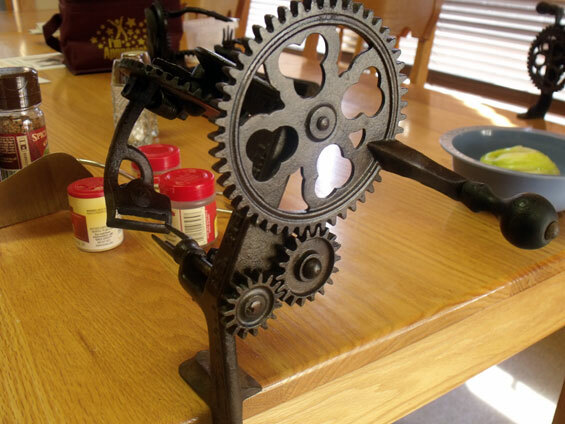 If you have tips, tricks, or suggestions for making a good apple pie, leave a comment below! Help Seed Savers Exchange preserve our apple heritage by becoming a member or making a donation today.